The Center was opened this year from the last weekend in May to the last weekend in October. The Center saw 43 visitors from 9 states and the District of Columbia. One visitor was walking the COHOS Trails and the other was biking through Stark. 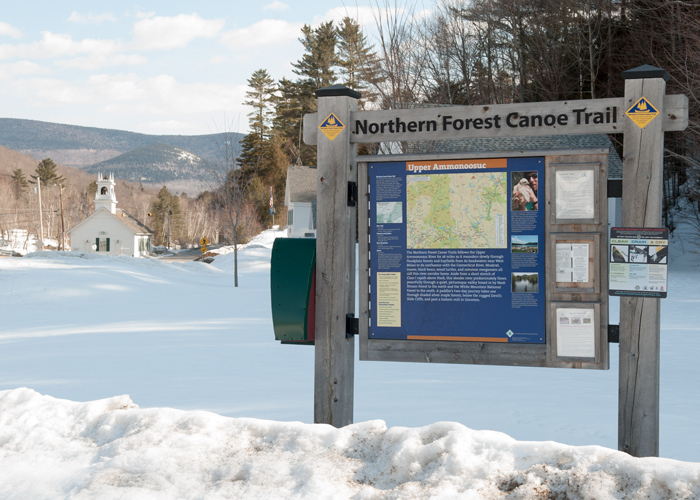 The Northern Forest Canoe Trail Kiosk also saw a few sign in this year. The visitor log has comments of praise about the displays, information and presentation. Visitors purchased Stark post cards and puzzles. New donations to the Center this year included a lithograph of Stark over 100 years ago, an old painting of the Old Man In The Mountain, an antique butter churn, butter mold, egg scale, bread mixer, wood stove irons, an old electric iron, a framed metal impression of a deer in the wild made in the 1950’s by a resident of Crystal, pictures of the Nash Stream Flood and very old black & white pictures of the bridge and church. The John Stark Park has a new large stone as you enter, paying tribute to the Stark Improvement Fund for its’ service, dedication and contributions to Stark from 1974-2011. Thank you to Mr. John Kauffmann who also visited the Center this summer.